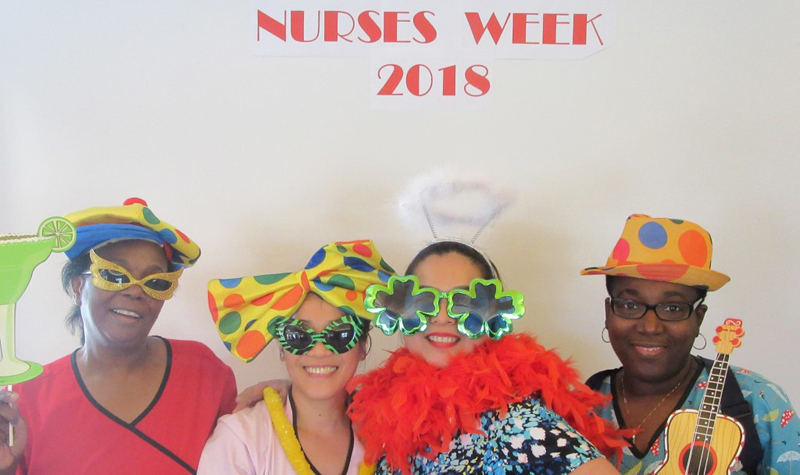 Forest Hill celebrated National Nursing Week with a variety of activities that both engaged staff members from all departments and reflected OMNI Health Care’s core value of fun and laughter. One of the events that was held throughout the week of May 7-13 at the Ottawa-area long-term care home was a trivia-based scavenger hunt. Every day life enrichment co-ordinator Craig Forrest gave a clue (that always had a rhyming scheme) that would lead to somewhere in the home. When teams arrived at the spot, they would find the daily question and they would answer it on a sheet that was collected at the end of the day. The team that answered the most questions correctly won a prize. “Throughout the week everyone worked really well together to find the questions and answer them,” Craig tells The OMNIway. On the Friday, Forest Hill hosted a barbecue for everyone. There was also trivia about Forest Hill and OMNI Health Care at the event, along with beanbag tosses and other games with prize giveaways. Craig says a favourite event during Nursing Week was a photo booth day. He says one of the benefits of working in a life enrichment department is that there are lots of props and costumes, so team members dressed up in costumes and had their photos taken. “The photo booth was really a lot of fun, and the whole week was great for everyone,” Craig says. Held the week of nursing pioneer Florence Nightingale’s birthday on May 12 every year since 1965, National Nursing Week aims to celebrate and acknowledge the contributions nurses make in our health-care system. OMNI Health Care homes make a point of including all staff members in their Nursing Week celebrations.